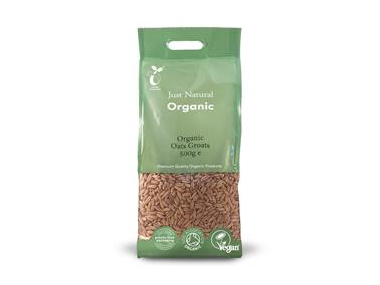 Order Just Natural Oat Groats 500g from the Online Health Food Store UK. Buy Just Natural Organic Oat Groats (oat berries) - 500g and other quality Oat Products safely online in the UK. Just Natural Oats, scientifically known as Avena Sativa, contain significant sources of dietary fiber, and form the basis of an energy packed, nutritious breakfast. If you want to automatically receive an email when 'Oat Groats 500g' is back in stock, just leave your email address below. Just Natural Oat Groats are also known as oat berries or whole oats or oat grain, scientifically known as Avena Sativa, contain significant sources of dietary fiber, and form the basis of an energy packed, nutritious breakfast. One component of the soluble fiber found in oats is beta-glucans, a soluble fiber which has proven effective in lowering blood cholesterol. NOW IN PLASTIC FREE BAGS! These plastic free bags are made from plants, so fully compostable! Our UK Health Shop sells real Just Natural and other Oat Products from top-quality brands safely online to customers throughout the United Kingdom in England, Wales, Scotland and Northern-Ireland. Where to buy Just Natural Oat Groats 500g safely online? Shop at the Online Health Food Store if you are wondering where you can buy Just Natural Organic Oat Groats (oat berries) - 500g safely online in the United Kingdom. Our Health Shop is located in the UK and our award-winning independent has been serving customers in England, Wales, Scotland and Northern-Ireland since 1976. You can buy our Oat Products online and we post out orders to any UK address. Oat Groats 500g - Just Natural Organic Oat Groats (oat berries) - 500g in Oat Products and Rice, Grains & Oats.